The Ohio Nature Blog: Agrilus planipennis- Coming to an Ash Tree near You! Agrilus planipennis- Coming to an Ash Tree near You! So flash back to 2003. I'm a young buck at our state resource agency, fresh out of graduate school. 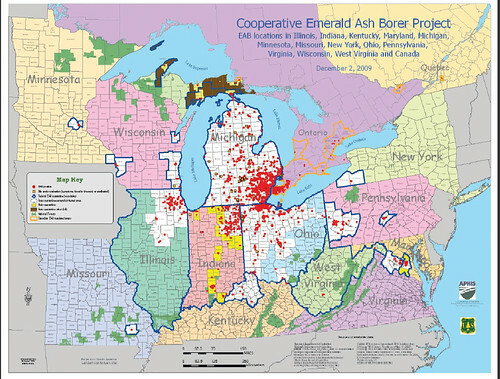 I'm sitting at a weekly meeting, listening to what the current issues in natural resources are when someone said something like this: "all ash trees in Ohio are going to die from this terrible pest called the Emerald Ash Borer that has been found in Michigan. It will be here before we know it." It was a little hard to believe. 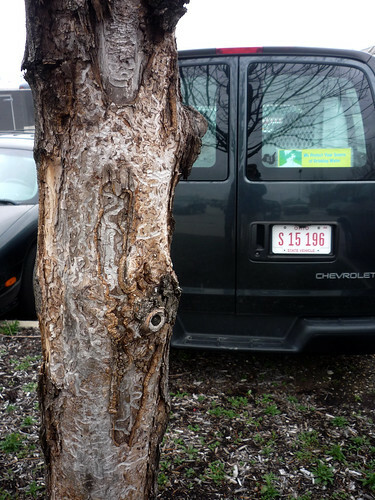 If you have heard of the Emerald Ash Borer (EAB), or live in an area where it has virtually killed all of your native ash trees, you won't be surprised by this post. If you've been to southeastern Michigan, you've seen the dead trees at the rest areas and in the wet, flat forests. The same goes for the Toledo area- look around in low wet woods, and you'll see lots of dead trees. Travel along State Route 2 in Erie County up near Lake Erie, and look at the woods this summer. You'll see lots of brown from dead and dying ash trees. You'll notice that there are plenty of red dots around central Ohio. Yes, it was found up near Delaware back in the mid 2000's, but I thought to myself that population was pretty far away. How naive I was. Late this summer, I looked out into the parking lot where I work. The islands are full of young planted green ash trees. Some had no leaves. What was going on? A closer look revealed this: the dreaded "D" shaped hole, the exit hole from which the adult EAB emerges after eating the tree and creating all of those interesting wormy patterns. So there you have it, a mere six years after I learned about the EAB, was told it would be here soon, and after I had pretty much discounted it, it had arrived, literally, at my doorstep. I planted 1,000 white ash trees at my natural area preserve in s.e. PA as a forest restoration project back in 2000. (Why it was a monoculture is too complicated to go into here.) The trees are 40 feet tall now and providing all the shade I anticipated. I expect to be replanting the stand (with a mixture this time) in the very near future. It's all so discouraging. From seeing what I've seen, your trees don't have a chance. It takes about five years from the first infestation in a stand until the trees are almost completely dead. We need a better system at the federal level to help keep the next EAB out of our hemisphere. Thanks for this great post and photos on a not-so-happy topic. But it is best to be informed and wary. While visiting a massive ash in Johnson Woods I too reflected on this sad passing of our native trees. What's next? Hemlock Woolly Adelgid- unless we get folks educated to recognize and report outbreaks as they occur. Thanks for all you do to educate (and entertain)on behalf of nature. I first heard of it in 2004, when we had a shipment of reforestation trees from OH go into quarantine here in Maryland. At that time, W Ash & G Ash were both HEAVILY used in reforestation and all types of other planting plans in the Mid-Atlantic - they have a good form, deer sort of leave them alone, and they don't have "pesky" nuts (to dent cars) or fruits (to stink up somebody's yard). By 2006, Maryland DNR would not accept any ash tree in a state-funded or required planting plan. DNR moved really fast to stay on top of it - including mowing down entire streets of Ash trees if just one tree is found to be infested - but despite their best efforts, EAB seems to be self-sustaining here as of 2008. Maybe it was 2003....sorry...and for the record, I'm a wildlife biologist, so I've never liked the trees. They don't provide great nesting habitat and they don't provide food for wildlife. Boo hiss! 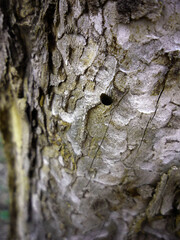 You can find a lot of information on emerald ash borer on www.emeraldashborer.info.